When Alzheimer’s rendered her father unable to care for himself, Rashedeh left her job as a seamstress to be his full-time caregiver. After his passing a few years ago, Rashedeh was devastated by the loss, and felt lost about how to shape the next phase of her life. Logistically, she knew that the minimal government assistance they were receiving would be discontinued, and she needed to do something to provide for her family. Rashedeh, a Palestinian Jordanian, grew up and still resides in a predominantly Palestinian settlement near the city of Irbid. She lives with her sister and niece and is their sole provider since the death of their brother a number of years back. Rashedeh started out as a seamstress when she was just a child to support the household and became incredibly skilled. She continued the work for thirty years until her father became ill. Throughout those years, she experienced low pay and poor working conditions, enduring extremely long days without breaks. 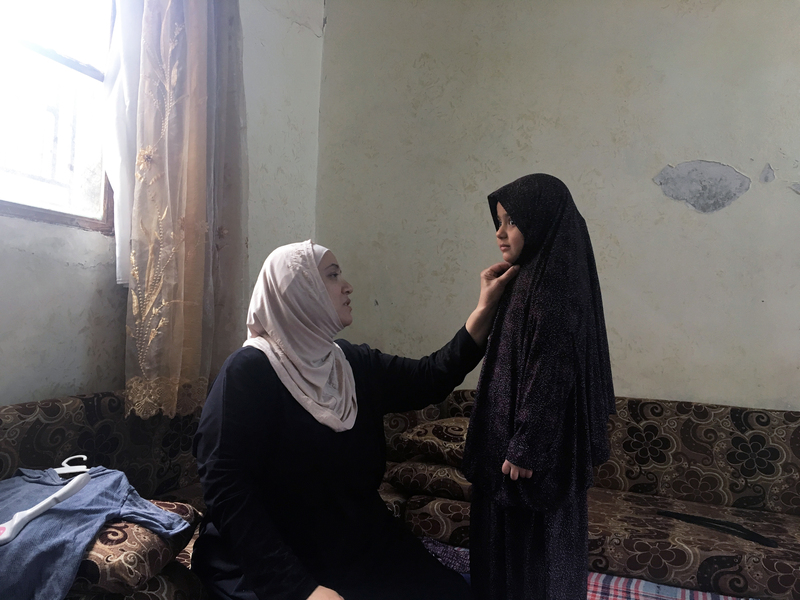 Resentful of this mistreatment by employers, Rashedeh hesitated to return to a tailoring operation following her father’s death. It was Rashedeh’s sister that told her about NEF’s Siraj Center, which is walking distance from her home. 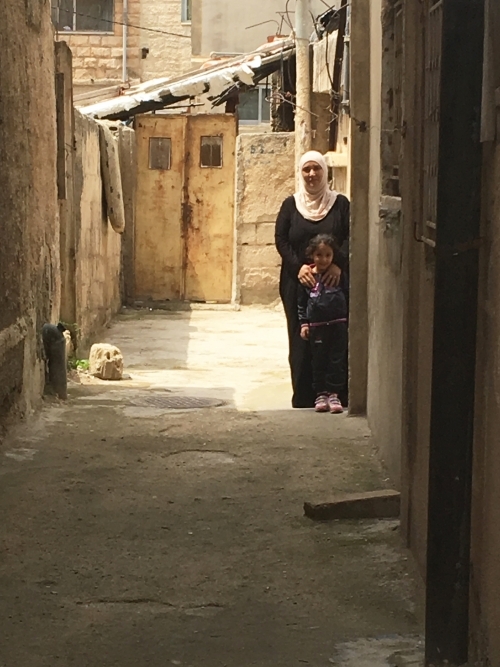 This Siraj Center is one of four hubs that NEF has established in Jordan to provide refugees and vulnerable Jordanians with access to training, counseling, and critical information to find jobs, start businesses, and improve their physical and mental well-being. Rashedeh’s family encouraged her to go to the Center to boost her spirits and see what opportunities might be available. After her first visit, Rashedeh learned that she qualified to participate in NEF’s business development training. Having only attended school until the seventh grade, Rashedeh cannot read or write well, so a friend was invited to accompany her and help her through the training. With the knowledge she gained, Rashedeh developed a comprehensive plan for a tailoring business, which was quickly approved to receive a project grant for 650 JOD (915 USD) to get started. She purchased two types of sewing machines to get established, and now says she feels confident in her ability to deal with customers, register her business, market her services, and calculate pricing and costs. Already having a reputation as a skilled seamstress in her community, Rashedeh developed a client-base quickly, offering a full spectrum of services including tailoring, repurposing, mending, and producing original designs. She has become known for making yanis, a popular prayer dresses for youth, which is now sought out by many clients. Because of the progress she’s made with establishing her business, Rashedeh was selected to participate in NEF’s advanced business development training, after which she received another 160 JOD (225 USD) to support its continued growth. With these additional funds, she made simple but valuable investments in supplies like fabric (including wool to prepare winter clothes), better sewing cutters, and lamps to improve the lighting in the sewing room. Rashedeh is now making more than 300 JOD (423 USD) per month, which covers her expenses and leaves her with 100 JOD (141 USD) per month for savings. She feels that she now has a clear vision for the future and hopes to eventually expand to a larger working space, as well as produce more original clothing designs for weddings and other formal events. NEF’s work in Jordan is currently funded by the U.S. Department of State Bureau of Population Refugees and Migration as well as the United Kindgom-based City & Guilds Group.